Kategorie: Politik Schlüsselworte: Casino-capitalism, Colonial History, East-West Contrast, Economic Crises, Economic Policy and Monetary Policy, Europe, Europeanism, Globalization, Islamism, Nationalism, Refugees, Secular Stagnation, Tax Policy, Terrorism, Trumpism, Unequal Income and Wealth Distribution, What is money? The fact that we must deal with the problems of the whole world today is a result of globalization. We must be aware of the fact that globalization is a globalization of our European spirit, our way of life, our technology, including the atomic bomb, our economy and society, and so we are responsible for what is happening worldwide. 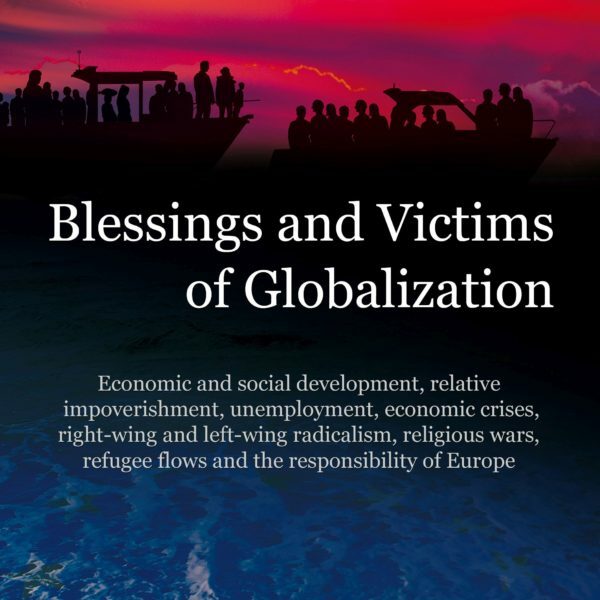 As a result of globalization, we cannot only observe a growing standard of living and a faster population growth due to improved health care and medicines, but we also have to complain about relative impoverishment, unemployment, economic crises, left-wing and right-wing extremism, religious wars and huge refugee flows. To the extent that the negative consequences of globalization affect the Western world, they lead to general uncertainty, which then manifests itself in a loss of confidence in political institutions. Even the greatest achievements of the post-war period, the overcoming of nationalism and the unification of Europe, are questioned and disproved, and salvation is sought in foreclosure and national autonomous regions. A possible interim climax has been this aversion to established institutions and powers in the election of US President Donald Trump who, and this is already the questionable nature of his programmed policy, promises, along with other billionaires and, with the promotion of capital market games, to lead the mass of the economically backward to new prosperity and new greatness. To this end, he wants to decouple the US from the world market and return lost industries to the country. All the small Trumps: Victor Orbán, Jaroslav Kaczyinski, Gerd Wilders, Marine le Pen, Beppe Grillo, and the leaders of the PEGIDA and the AfD and their followers in Germany, cheer him and also proclaim their independence and their intention to leave the Eurozone or even the European Union. In doing so, they forget that the US can afford to foreclose and be self-sufficient because they have such a large domestic market that they can force foreign manufacturers to produce in the USA if they want to sell there. But who else wants to invest in smaller European countries? From purely economic market perspectives, these nationalists would lead their country to the outside and without the backing of the other European countries and without the European Central Bank defending them against the growing monetary and economic turbulences. What a withdrawal from the European Union means can be clearly seen in Great Britain according to BREXIT, if Great Britain can still be called „great“ after a loss of Scotland. Their ray of hope is that Donald Trump would help countries leaving the EU. He only thinks of America and only recognizes strength. Of course, he is interested in the fact that the power factor of Europe is disintegrating. Since the European Trumps do not recognize the need for a strengthening of Europe, in order to be able to confront America and other great powers, they also prove to be political twits. The increasing dissatisfaction with the given circumstances is not unfounded. It is the result of an inadequate development of the economic and social theories and ideals and the policy determined by them. Disharmonies developed in this way. In particular, there was an increasingly unequal development of wealth and income. Apart from the social injustice involved, an ever-growing economic demand gap arose as a result of the too high savings in relation to the promising investment opportunities and innovations. The demand gap could only be compensated by increasing government expenditures or by the fact that, as in Germany, excess demand is shifted abroad by export surpluses. Thus, the growth rates remained lean and favored almost only the already wealthy. Only the capital market games flourish and celebrate the breakthrough of ever higher stock index brands. In order to understand economic development and globalization, we must analyze the underlying motivations. It will be shown that the driving forces and objectives of economic development and globalization are based on the special intellectual development of Europe, as it grew out of an antique and Jewish / Christian heritage. The naivety of the assessment of contemporary history, society, and thus economic development also means that a man’s image is expressed according to how he has always been more or less structured and assessed as in the modern Western world. This also makes it unclear why civilizations and cultures have developed differently and why it is not possible to introduce Western democracy into any social order. It must be realized that the spirit of people, their feelings, their willingness, their behavior, their self-confidence have only developed over many thousand years and the development has been different in the individual countries. Many things are common to all men, but many things are also different, and if these differences are not heeded, no reasonable interpretation of social, economic and political conditions is possible. 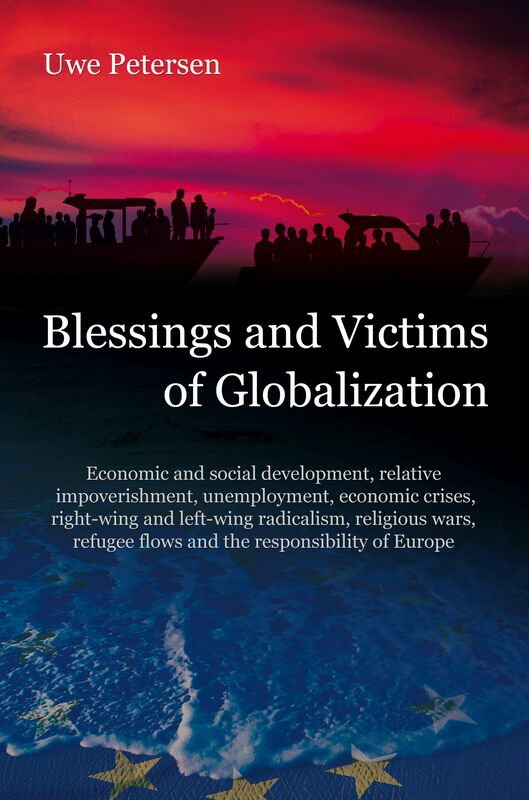 The analysis of the economic, social and political conditions of the world also shows that it is not enough simply to compare power relations, economic development and raw material reserves, but that spiritual and, in particular, religious motivations can be much more important drives for political and social actions. The failure of the US in Vietnam, the Iranian revolution, the quick growth of the IS, and its assertion cannot be explained otherwise. It may come as a surprise to the contemporary reader that we trace the discussion of the problems of globalization back to religion. But if one considers how far other religious denominations, especially Islam, determine the social ideals of Muslim countries and international politics, then it should really be possible to understand that Europeans should also refer to their intellectual heritage and the resulting behavior, especially in order to meet other religious demands and to understand their own position. Thus it should be allowed, since Europeanism has as its roots in antiquity and, Christianity, to reflect on their essence. In the discussion of Europeanism, it must not be overlooked that it is divided into a western and an eastern component, both of which have been globalized. The leading countries for Western Europeanism were Great Britain and later the Anglo-Saxon world, dominated by the United States. The Eastern Europeanism is represented by the Eastern European countries, initially most notably by Poland, but then more and more by Russia with its expansion to the Black Sea and to Vladivostok. These two Europeanisms and their globalization became antipodes since the founding of the British and the Russian Empire. In particular, Russia’s efforts to become a sea power since Peter the Great, and his urge for the Black Sea, the Persian Gulf and the Indian Ocean, were felt by the British to be threats to their route to India. The resulting East-West opposition continued to determine nearly all conflicts in the Near and Middle East caused by the East-West divide after the Russian October Revolution and superimposes the current conflicts in Ukraine and the Middle East. Europeanism as the source of Globalization. The crisis and the further development of Europeanism in the globalized world. In order to make the importance of East-West opposition clearer to Western readers, the intellectual, social and political motives of Russia as bringer of Christian salvation, Third Rome, and Eurasia, which are now increasingly determining the Russian politics, and also Poland’s antagonism against Russia, is discussed in more detail. To understand the impact of the globalization of Europeanism on countries outside Europe, their development has been described in more detail. Every country has its own problems and can influence world peace.